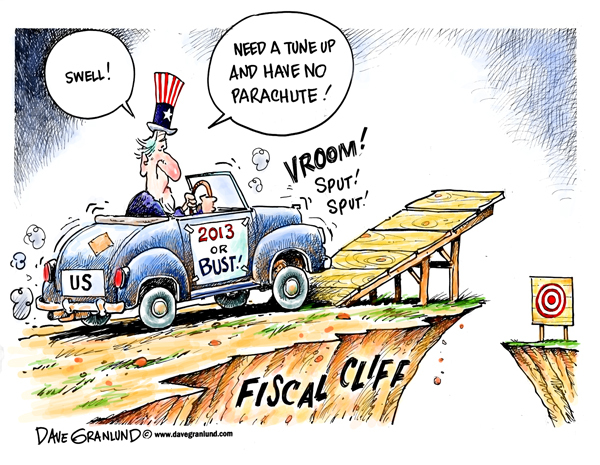 Where does the term fiscal cliff come from? 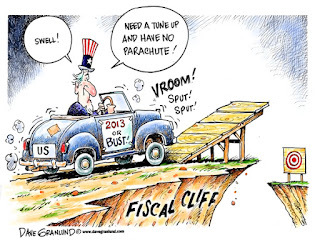 The 'fiscal cliff' is the phrase used by Federal Reserve Chairman Ben Bernanke to describe the situation US economy will face in January 2013 if political agreement is not reached in Washington. At that time a series of tax rises (the expiration of the 'Bush tax cuts') and spending cuts (part of a previous agreement) will take effect. Both sides are hemmed in by the 'debt ceiling' - a legal limit to the amount that can be borrowed - and the a previous agreement that tax rises and spending cuts will automatically be triggered if talks ultimately break down. The Democrats - including the re-elected President - are refusing to cut expenditure on programs like Medicare. They insist on tax rises for 'the super rich' or 'millionaires and billionaires' as it expressed in electoral rhetoric. The Republicans call the potential crisis 'Taxmageddon'. While the Democrats do not want to cut spending they are opposed to tax rises for any income group. They argue that a 'rich tax' will hurt small business, discourage investment and raise very little revenue (the Laffer Curve is often cited in this argument). Republicans believe that deeper spending cuts are necessary to avoid financial catastrophe - the 'misery' predicted by Mr Micawber. Difference between fiscal and monetary?